Bhindi Do Pyaza is a simple stir fry of Okras and Onions with just few spices. It’s one of the simple dishes which can give very tough competition to any complex dish. Flavour wise, the combination of crunchy okras and sweet onions can blow you away when cooked right! fried, sautéed, gravy or stuffed. 1. Wash and dry the okra thoroughly . Trim the ends and cut them into one inch pieces. 2. Heat one fourth tbsp of oil in a cooking vessel. 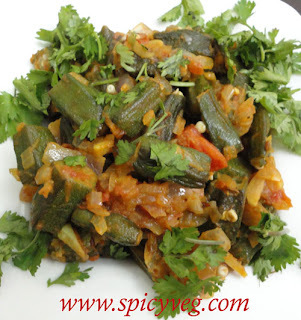 Add the sliced okra pieces and stir fry them till they are three-fourth cooked. Constantly stir fry on medium to ensure they don’t burn or stick to the pan. Add salt and turmeric powder and remove. 3. In the same pan, add the remaining oil. Add the cumin seeds and toss for 8-10 seconds. Add the asafoetida, grated ginger and immediately add the sliced onions and saute till they are transparent yet crisp. 4. Add the chilli powder, coriander powder, garam masala powder and saute for 2-3 minutes. Add the chopped tomatoes and cook further for another 4-5 minutes. 5. Now add the stir fried okra and combine well and cook further uncovered for 12-15 minutes. Combine well and adjust salt. Turn off heat. 6 Garnish with fresh coriander leaves and serve with hot rotis or rice.